i wish i could brush water this good ._. i wonder how it would have turned out if you vectored the 2 girls. the colors sort of fainted a bit, maybe it's just me. anyways nicely done. oooo, I wanna go to the beach! You did an awesome job with the water and all ^_^ Very well done. Love the lighting and bg as well - thanks for sharing! Nice wall I like the ocean scene in the background really nice. Nice job keep it up, Fav. But i would prefer the mountains to be green, or some sort of a different colors other than blue in the background. Such a peaceful and calm wall, I absolutely adore this wallpaper and I really can't believe that you did such a beautiful job with the waves, I know that you were looking for an ocean tutorial before, but wow, you did them perfectly *______*. First off, I have to say that the scan is just beautiful. Such a cute and adorable scan to choose and I can't help but to admire the high quality of it. Excellant selection, Candy-chan. Second, the background. This is what really drew me in. The scenery that you do has always been the apple of my eye. No matter what work it may be from, it has always caught my attention. You, once again, have been able to do that with this rather simplistic, yet beautiful background. The water, first off is very soft and lush, it has a cartoonish feel to it, making it a very fitting style to go with the scan. Second is the sky, which once again is the apple of my eye. The lighting is just perfect, giving off the impression of a beautiful day filled with some clouds and the sun shining down from above on the girls. The clouds are very nicely done, very soft too and just the right amount so that the viewer can admire the blue-ness of the sky. Everything just comes together so very nicely to form simply one of the best ocean walls I have ever seen. Just enough water but not too much, along with the clouds and landscape, it's just perfect in the right amounts making for a very calm and serene enviroment. What can I say? I really like what you've done, Candy, this is my favorite of the week hands down. I absolutely love this new wall and it's my current desktop too, I just feel bad for taking so long to comment on this beautiful piece of artwork. As always, I look foward to your next piece. Quite simple, but this is sweet. 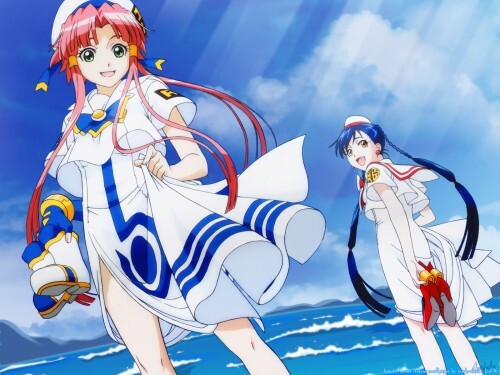 I don't know why, but it seems that Aria images are very suitable for this kind of calm, happy, and relaxing scenes. Combined with the painted look of the background, it's sooo soothing that my eyes can stare at it for hours without getting bored (rather, eventually getting tired because of the monitor's high static radiation, but that's just my crappy CRT). It's definitely one of those animes with top-notch artworks, and this wallpaper composition just makes it even better. Oops.. I rarely comment this long <_< might as well just fav it and set as my new desktop.. I like it. the water looks great.